Bipolar Disorder is a homegrown tornado, a swarm of insects buzzing in your ear, a picture of an eye that winks back at you. Discover it in a way you never have before. Discover prosthesis. Discover in prosthesis mental illness, the human mind, human hope and fear, love and hate, dream and defeat. It is a place of struggle, planning and realization, willing and creating. Walk a journey unlike any other, meeting fellow travelers, obstacles and unexpected turns, a labyrinth of recovery that seems to suspend time and invite you to embody the experience of mental illness in completely new way. a while sleeps. She is the author of several poetry chapbooks and collections and the novelette Finger : Knuckle : Palm (LucidPlay Publishing, 2014). Ariana is the founder of ELJ Publications, a small press featuring a number of serials, series and contests, including Emerge Literary Journal and scissors & spackle. Ariana believes in words, what they have to say to the world, to the reader, to you. She hopes her words touch you and thanks you for your interest in prosthesis. 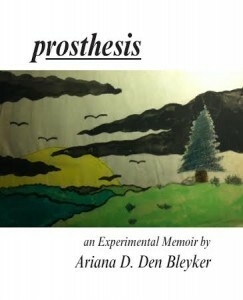 This entry was posted in 2014, Ariana Den Bleyker, Book, Merchandise and tagged Ariana Den Bleyker, bipolar, blogging, depression, mental health, pittsburgh poetry, poetry collections, psychology, women writers on August 28, 2014 by bookdog.